The Epic Hydration Holder is the perfect companion for all fitness enthusiasts! Made of 420HD nylon, this patent pending adjustable water bottle holder measures 6.6"L x 3.3"H and accommodates various sized water bottles. Features include a zippered main compartment with an earbud port, allowing music to be accessed from a mobile device (can accommodate up to an iPhone 7 Plus), and a breathable sport mesh handle with an adjustable hook and loop fastener strap. Not just for the gym and home workouts, you can also take it out while jogging or bike riding, as it's equipped with reflective accents for added safety. 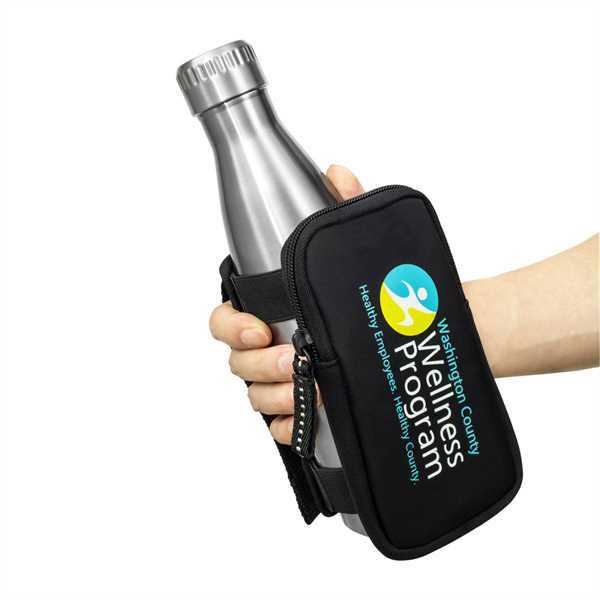 Promote a healthy lifestyle and your brand using this handy item!